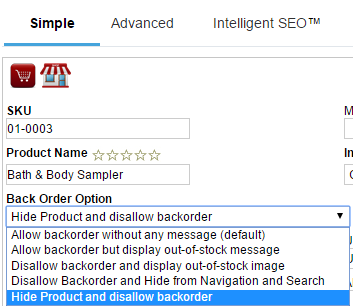 What backorder options can I apply to my SKUs? This option allows customers to purchase the item and will not let them know that the SKU is out-of-stock. Note that you must have inventory to ship the SKU after the order is placed. This option will allow the customer to add the SKU to the cart, but will also display your out-of-stock image. Note that you must have inventory to ship the SKU after the order is placed. This option will not allow the customer to add the SKU to cart if out of inventory and will display your out-of-stock image. This option will prevent the SKU from being added to cart if out of inventory and will prevent the SKU from being accessed via navigation and search. This option hides the SKU completely and prevents access to the product page when the SKU is out-of-stock. All these options are also changeable in bulk via Import/Export.